Hand dyed cotton covers with "tree prints" in purple. William and I went to the park this past fall and held the fabric against a tree while I rollered waterproof ink to get the impression of the bark. The same fabric is used as guards around each of the signatures which double as tabs between the pages for Melly to attach things. Because the paper has raw edges I left the fabric edges raw as well. 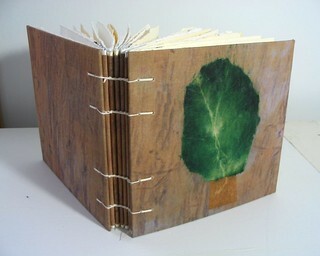 The tree on the front cover is hand dyed paper (fabric dye) and the trunk is hand dyed paper (onion skins). The pages are St. Armand water colour paper (two shades, plus two more shades for the tabs). It's hand made in Montreal. The book itself is bound in the Coptic style using a four-needle stitch.